This isn’t the first time I’ve seen Stanley Kubrick’s Full Metal Jacket. I remember when I first saw it about 5 years ago, I didn’t particularly like it, agreeing with mostly everyone else that the first half of the movie was a lot better than the second. However, on a whim, I decided to see it again tonight. Full Metal Jacket, based on Gustav Hasford’s novel The Short-Timers, follows Joker (Matthew Modine) as he navigates United States Marine Corps basic training under the guidance of Gunnery Sergeant Hartman (R. Lee Ermey) and eventually winds up in Vietnam as a combat correspondent. Full Metal Jacket really isn’t like any other war film I have seen. I could tell Kubrick was depending a lot more on his actors than Francis Ford Coppola did in his Vietnam War epic Apocalypse Now (1978). Here you don’t have epic US Army helicopters flying in and blowing up Vietnamese villages. In fact, ironically enough, combat played a very small part of the movie. The movie is essentially two shorter films glued together to make one. The first act is the infamous boot camp portion, where Joker endures Hartman’s (It should be noted that Ermey was actually a drill instructor during the Vietnam War) training, designed to turn normal people into trained killers. The second half sees Joker hook up with Lusthog squad during the Tet Offensive as they clear Viet Cong out from the city of Hue. Full Metal Jacket was a war movie very much centered on its characters. We see how the Marines’ boot camp is designed to turn ordinary people (back then, the draft was in full swing) into trained killers. We also see how some people, like overweight and inept recruit Gomer Pyle (Vincent D’Onofrio), just can’t take the pressure of Hartman’s brutal regimen. Hartman succeeds shaping most of the platoon. When he punished the whole platoon for a mistake Pyle made, they threw a blanket party for Pyle in revenge. Most people praise Full Metal Jacket for its frighteningly realistic depiction of Vietnam War-era boot camp. Where the movie really stood out, in my mind, was the sniper battle at the end. Joker’s squad is pinned down. Three Marines are killed. Joker makes his way to the sniper’s nest to find….it’s a young girl. The reason both the boot camp half and the sniper scenes were as good as they were was because Full Metal Jacket featured some absolutely terrific actors working under Kubrick. Vincent D’Onofrio absolutely nailed his character as he slowly deteriorated mentally, culminating in an absolutely shocking end to the first half (If there are people who haven’t seen Star Wars yet, then there are people who haven’t seen Full Metal Jacket yet, so I won’t spoil). In the latter scene, PFC “Rafter Man” (Kevyn Major Howard), despite having complained to Joker earlier on about not having seen any combat, is absolutely unable to contain his ecstasy of having mortally wounded someone, despite it being young girl (Ngoc Le). The sniper writhes in agony as Joker is faced with a difficult decision and Rafter Man stares on gleefully. 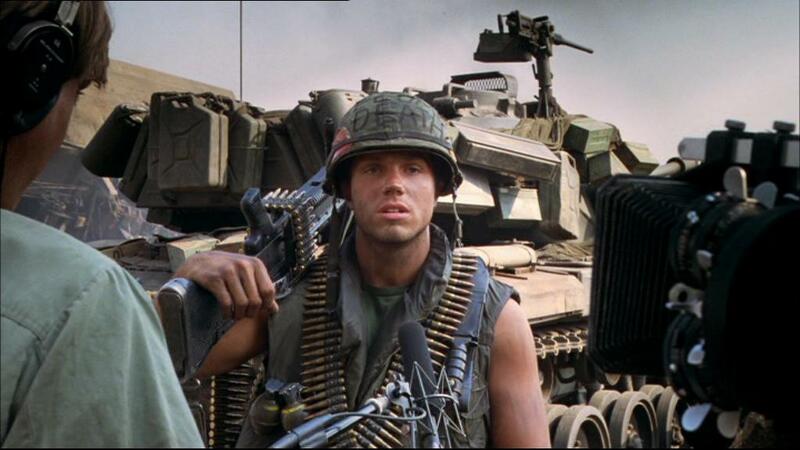 Full Metal Jacket had more than its fair share of the Kubrick stare. My chief complaint with Full Metal Jacket was its two-part nature. That format worked better in the novel (which was divided into three parts) than it does in the movie because I felt the first half didn’t seem to have any ramifications that carried over into the second. Joker didn’t seem to have much trouble getting over the events of the first half’s conclusion. Joker and Cowboy (Arliss Howard) were the only characters to appear in both halves of the movie. I also felt there were times where the movie was trying a tad too hard to be funny, such as the scene where Joker and Rafter Man encounter the prostitute in Da Nang. The placement of that scene felt odd because it was the first scene of the Vietnam half, right after the end of the boot camp half. Finally, it seemed a little too obvious to me the movie wasn’t actually shot in Vietnam; Hue kind of looked like a bombed out city in England because it was in fact a thinly disguised bombed out city in England. Despite that, Full Metal Jacket is a movie I’ve grown to appreciate now that I’ve seen it again. It’s neither the best war movie nor the best Kubrick movie I have ever seen, but it’s worth seeing maybe twice, the second so you can pick up a lot of the motifs that Kubrick sprinkled threw out (anyone notice the Mickey Mouse behind Joker before Lt. Lockhart sent him on assignment? ).